If you’re planning on visiting the Redwoods in California for the first time, don’t go the Redwoods National Park. The trees there have been replanted and are young, which is too bad because a lot of the beauty of the redwoods lies in their advanced age. Instead, drive to the State Parks: Jedediah Smith Redwood State Park, and Prairie Creek Redwoods State Park. There, the trees are much older, bigger/wider and have the most gracious shapes. By the way, they’re named Coastal Redwoods, because they’re growing near the Pacific Coast. The biggest city here is Crescent City, which is a pretty desolate – “used-to-be-a-lumberjack” town. Less than 5% of the original Coastal redwoods forest is still alive, so we really wanted to take the necessary time for a communion with these ancestral trees, allowing three days for camping and hiking. There are loads of hikes to do there, we picked two day hikes that were long enough to give us a sense of the diversity of species living in the Redwoods forests, and the gigantism of the trees. The trail starts at Stout Grove Trailhead. 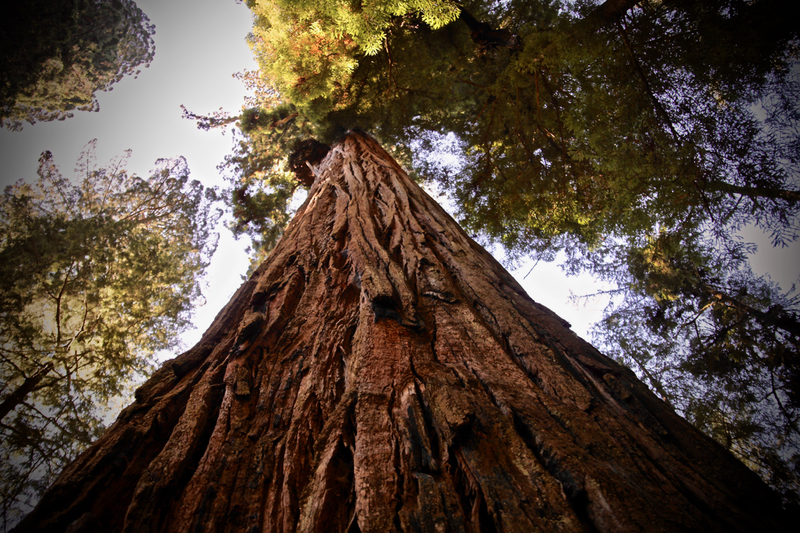 The hike is 5.2 miles long (round trip) and takes you to the beautiful Fern Falls, passing in front of the gigantic Boy Scout Tree and many other huge, tall, wide, old trees. TALL is an understatement. These trees are almost touching the sky. Most of them are so tall it’s hard to see the tree top. My dream would be to see the canope from above, it must be an incredible view. There’s some great Instagram-worthy picture taking to do there, so make sure you allow enough time for that. The Boy Scout tree is indeed very big, but all trees are big so it really doesn’t matter which one you pick for your photo. There’s only one keyword here: BIG. Fern Canyon is one of these destinations you can reach the lazy way (driving to a parking lot and hike one mile or so), or the hard way (7 miles round trip from the Prairie Creek Redwoods State Park Visitor Center). It’s obviously worth choosing the hard way, because you’ll see more trees on the way, and some with really weird shapes. It’s very easy to go inside a dead tree on this trail. There was some wind that day in the forest, and the trees were dancing from left to right and right to left. It is a little scary, we were wondering if one of them is going to decide to fall that day. Of course, it doesn’t happen as these trees are more solid than the rock that surrounds them. Unless some park ranger put a million hours of work to cut one down. This tree was about 150 years old! The hike passes a few creeks, and takes you to Fern Canyon. It’s a totally different landscape here, and it has no longer anything to do with tall trees, but what a sight! It’s a 1-mile canyon with walls covered in vegetation. Honestly, the only place where I had seen this, was a vegetal wall made by an artist in the city of Paris. We had so much fun hiking this canyon, it was like being inside a plant. Shortly after hiking Fern Canyon, we took a left, arrived at the beach, and saw a make elk. During mating season (stay not to close). On our way back, we stopped at the Corkscrew Tree. This tree is famous because as you can see, it is actually two mingling trees. The corkscrew tree, really? What a poor naming decision. Americans are not very romantic, this should be the Love tree or the Romance tree or something. Here’s one last picture of our van posing in front of some more Redwoods, to make sense of how tall they are. We used the KOA in Crescent City as our base. It’s not free, but it’s a really cool campground because you get to camp among some of the trees! I highly recommend it.